Lorena Benson of Camarillo may be the oldest Ventura County resident. Born Sept. 27, 1900, Benson turns 108 years and 6 months on March 27. "She's getting up there," said her daughter Bonnie Lowe, 81. "But she's still amazing to me. . . . She's such a great lady." The second of 10 children, Benson grew up on a South Dakota farm at a time when water pumps served as kitchen faucets, iron stoves were wood-fueled and indoor toilets were rare. 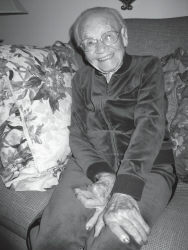 Profiled in the September 2007 Camarillo Acorn for her 107th birthday, Benson has a family history of longevity: Her mother lived to age 96 and her grandmother to 101. Her one surviving sibling, an 88yearold sister, lives in the Los Angeles area. Benson moved to Los Angeles at age 25 and worked as a teacher until she married Charles Benson. They raised four children together. In the 1950s, when Charles became ill and could no longer work, Benson returned to teaching to help support the family. At the time of her husband's death in 1952, the couple had been married for 26 years. Benson retired from teaching in the early 1960s. In 2003, Benson and Lowe moved to Camarillo. Lowe's son joined them, and the three lived together until October 2007, when Lowe could no longer care for Benson. Lowe hated having to put her mother into a nursing home but is pleased with the care she's receiving at the hilltop home converted into an assisted living facility in a neighborhood near Las Posas Country Club. Benson's day usually starts around 7 a.m. with a shower and breakfast—she has few dietary restrictions—then she exercises her arms and legs. If the weather's fair, Benson and the other residents take a walk or exercise outdoors. The house staff encourages Benson and the others to walk as often as they can, Lowe said. In the afternoon, Benson usually takes a nap; she eats dinner around 6 p.m. and heads to bed about 9. Almost every day, Lowe visits her mother to read or chat. Sometimes Lowe brings a memory book made by family members to chronicle Benson's life. Pouring over the photographs usually jars her memory of family, friends and past experiences, Lowe said. Benson's eyesight is failing, and she doesn't talk much because of poor hearing. She's also had to give up two of her favorite pastimes, reading and card playing. But she enjoys the company of others. When she's able, Benson joins other seniors at the senior center for a movie or dance, although her participation is limited. "She's always game for anything, it seems like," Lowe said. Approaching 109 years of age, has Benson accomplished all her goals? "No," she said emphatically. When asked last week for words of wisdom, Benson laughed and said she couldn't think of any, then added she's not very wise. "Mom, you raised me in a wise way," Lowe said, touching Benson's arm and leaning into her ear. "But kids don't always pay attention." Lowe then reminded her mother she taught her children to think independently and value education. Benson inspired her family to pursue higher education by working her way through college, Lowe said. And her lifelong practice of daily exercise has been a living example of its benefits, Lowe told her. Benson has three surviving children, 12 grandchildren, 21 great-grandchildren and seven great-great-grandchildren, but most of them live out of town and usually visit only once a year. If anyone is interested in meeting Benson, she would welcome visitors, Lowe said. Those interested can call Mom's Place at (805) 389-8966 for an appointment.